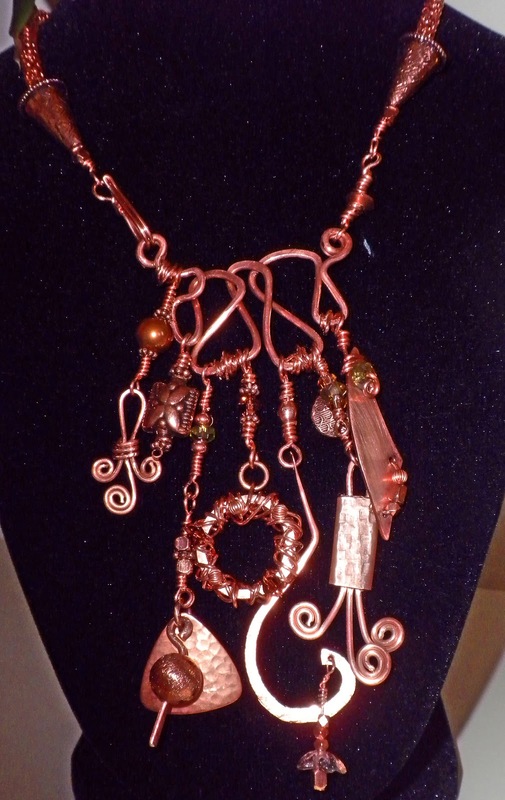 Even though I still love my beads and fiber, I've fallen in love with wire and metal jewelry. 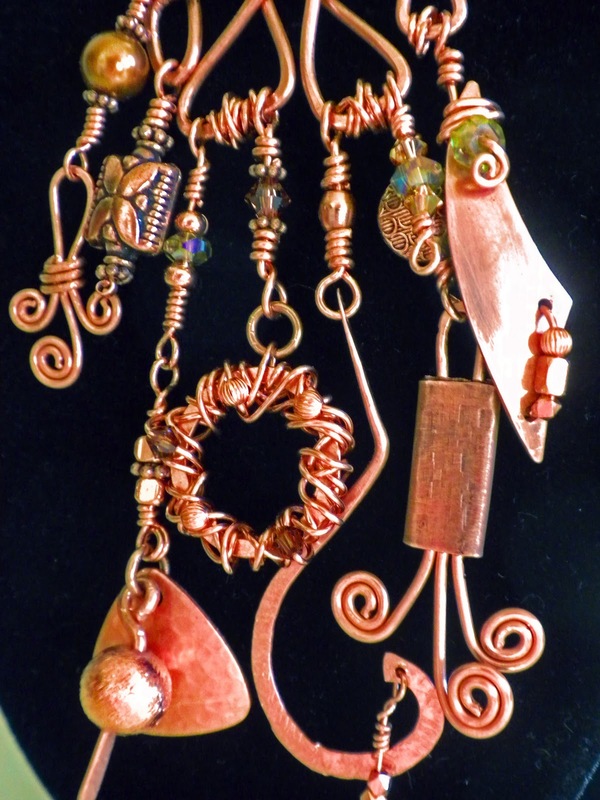 I've been learning on my own, and I've been taking classes with Dia Daniels at Bead Soup. Dia is a great teacher and we have the same taste in design. Every time I see Dia I fall in love with the jewelry she's wearing that day! In the fall I took her "Brangles" class. It's her version of a Conni Fox design. It's called a "Brangle" because it's a bracelet that has elements of a bangle. I completed the first one and then decided I wanted to make two more to coordinate with the first and then wear them together. So, since the holidays were looming I put it aside until January. Then I got to work! And, here is a picture of the results. I just love these braceles and they were great practice in making wrapped loops and clasps. They are actually a series of links with several beads on each link. The clasp is created in the last link so it's integral to that link. The most difficult part of making the bracelets is sizing. I had to do a lot of playing around to get the correct size. But I'm so pleased with the way they've turned out! Here's a close up of one of the links. Not long after I finished the brangles Dia taught a brooch class that she calls "Chaos Theory". As she explained it, she was cleaning up her workspace and had all these sample charms and links and decided to make them into something. And, so Chaos Theory was born! Naturally, I loved it but I don't wear brooches very often. So, I made mine into a pendant. Oh, my, how I love it!!! The entire piece, except for the bead caps, is made of wire. There are some beads and two copper charms, but the remaider is hammered wire. I learned so much from this class. Once I finished the pendant I decided, rather than hang it from a chain, I would make a Viking Knit chain for it and have the hook in the front, using one of the loops as part of the closure. I just love the results and I get so many compliments when I wear it. But, it was the learning that resulted from making this project that is the most rewarding. It opened up new avenues for using wire. And, my skills are improving greatly. I have several other wire projects that I want to work on, and now I have more confidence to tackle them. It's been a great adventure for me. I'll end this post with a few closeups of the pendant the the chain. Thanks for stopping by today! I hope you have a great day! Very nice Maryanne, I enjoy working with wire also, but I'm not as good at it as you are. Hi there! I found your blog through Sally Russick's Color Blog Hop and decided to pop on over...and I am glad I did! Your wire-wrapped bracelets are beautiful! Wire-working is my favorite way to incorporate the lovely beads out there!